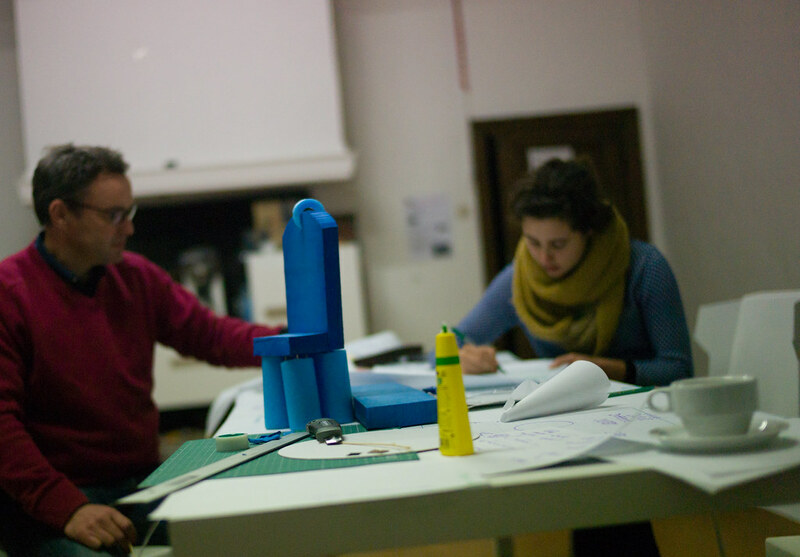 This workshop on the futures of democracy was held at Z33, as part of the Future Fictions exhibition, on the 4th and 5th December 2014. 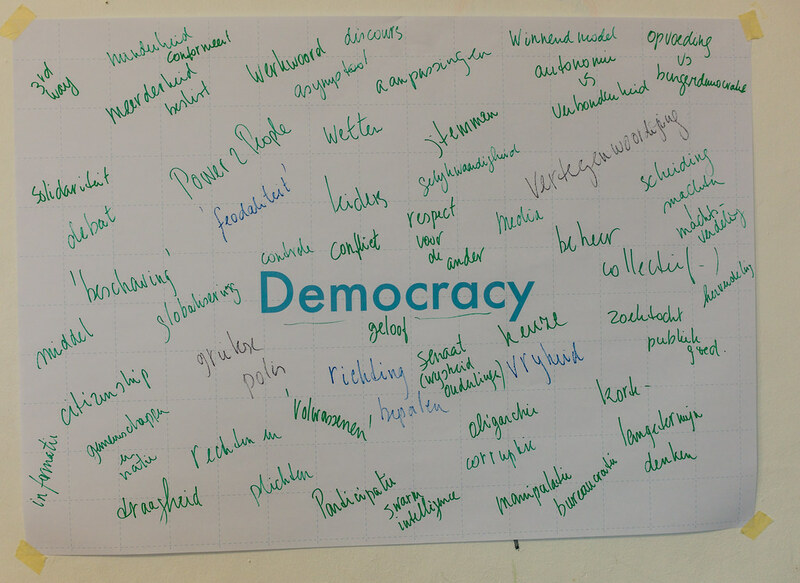 De bedoeling van de workshop is om samen nieuwe “Agoras” te bedenken, uitdagende werelden die uitnodigen tot het verkennen van nieuwe toekomsten voor “politiek en democratie”. We gaan niet op zoek naar oplossingen voor problemen vandaag, maar speculatieve beelden over morgen om het debat omtrent de huidige realiteit te voeden, te verruimen, te verdiepen. 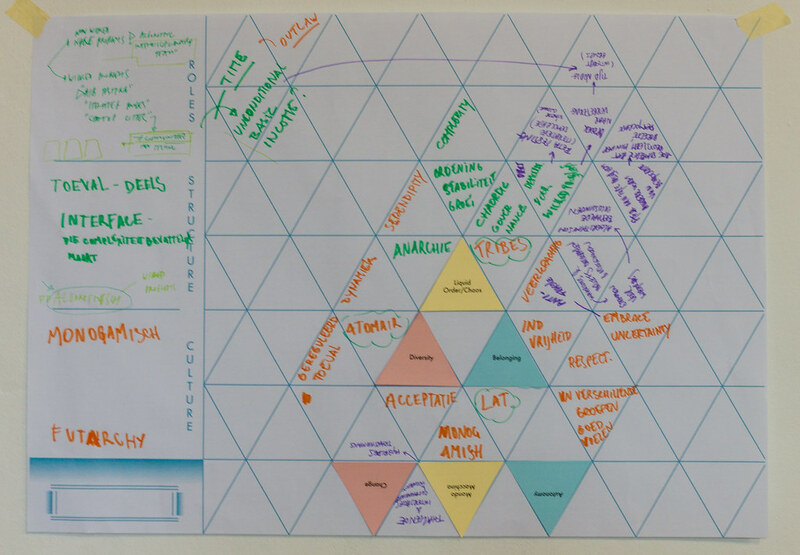 With the territory mapped out in keywords, the facilitators asked us to choose three concepts written out on different coloured triangles. One for a societal need, one for an individual desire and one for the context in which these needs and desires might take place. We could choose at random, or pick things we were interested in, or add our own terms if none of the prepared ones captured our fancy. Most of the chosen combinations sparked a range of associations in our minds: Justice and stability in the context of neo-nomads; diversity and belonging in a world of liquid order/chaos; autonomy and change in a 'mondo machina'; or a combination picked with eyes closed - shelter and peace in a society where all are for knowledge and knowledge is for all. We split into two groups and proceeded to create 'micro-worlds' for each of the three triangle-combinations. This worldbuilding took most of the first day. We discussed what the worlds might be like, as well as what democracy would look like in them, speculating about the culture, political structures and roles people might have in the society. We created six micro worlds that we presented to each other at the end of the day. The next morning three new participants joined in, while one left and the language changed from Dutch to English. We spent a good hour explaining the micro-worlds to each other and the newcomers, with the aim to see if any of the worlds could be merged. This was in fact the case. We ended up splitting into two groups and merging 2-3 worlds in one. We spent the rest of the day in the same breakout groups fleshing out the scenarios through 'storycrafting' (although some of us might still call this exercise worldbuilding). 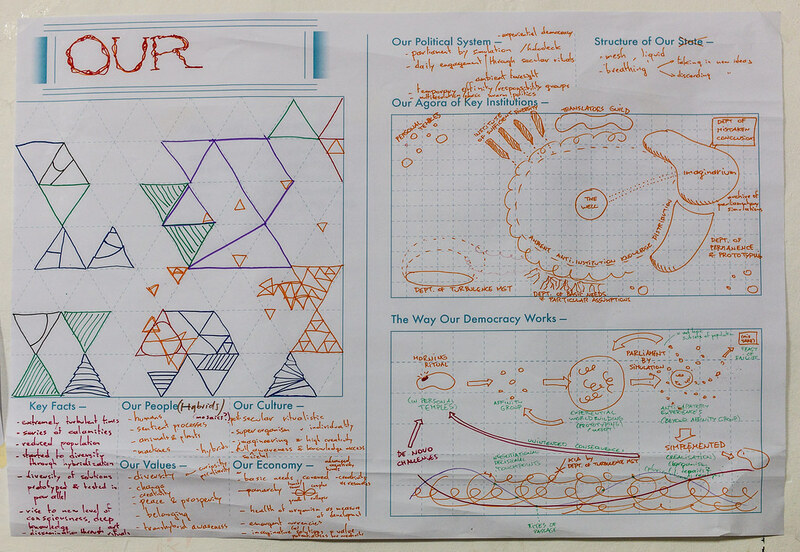 We discussed what the world was like, gave it a name and mapped its territory in key facts (history, geography, systems…), people, values, culture and economy. 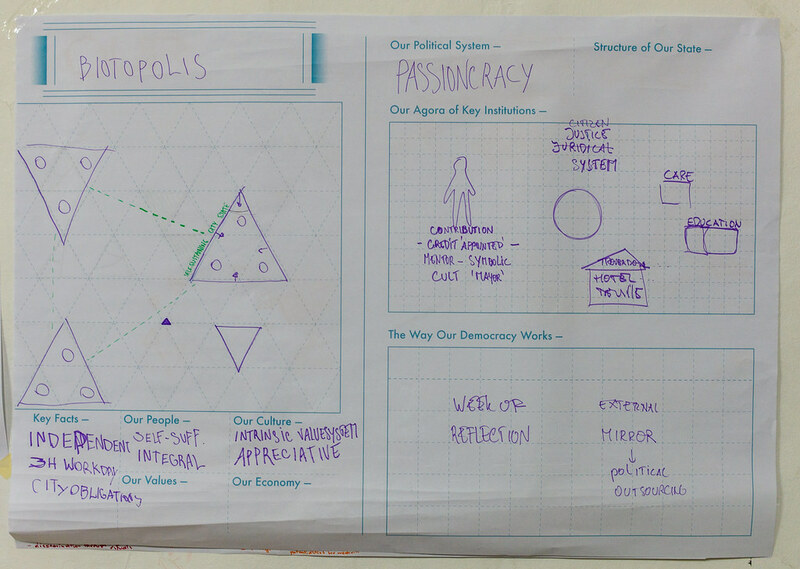 After getting a good sense of the basics of the world and its people, we looked at what their political system might be like and which institutions (or agora) were used to practice democracy and finally we explained the process of how democracy works in this world. The last hour was spent individually crafting concrete 'things' from the worlds. Some of us chose to build models of the Agora, others to write stories or make a newspaper, others prototyped key artifacts that were used in the democratic process. 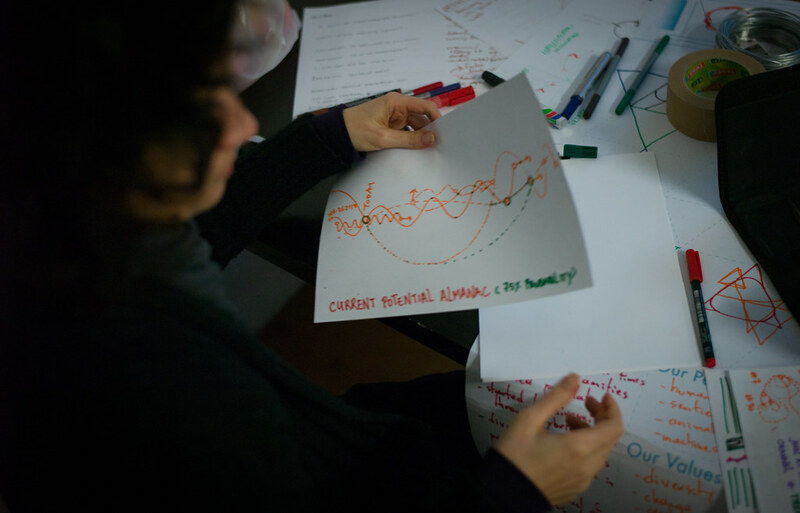 At the end we presented our creations and worlds to each other and had a round of reflection on the content of the workshop and the question 'what might be the futures of democracy'.